This category features all post related to Project Watershed Puntledge River projects, and Streamkeepers and Wetlandkeepers activities. Wetlandkeepers is a 2½ day introduction to wetland stewardship. The course offers individuals an opportunity for hands-on practice of wetland conservation skills, such as conducting wetland, plant and bird surveys, wetland mapping and raising public awareness. Participants that successfully complete the course are awarded a Wetlandkeepers Certificate. 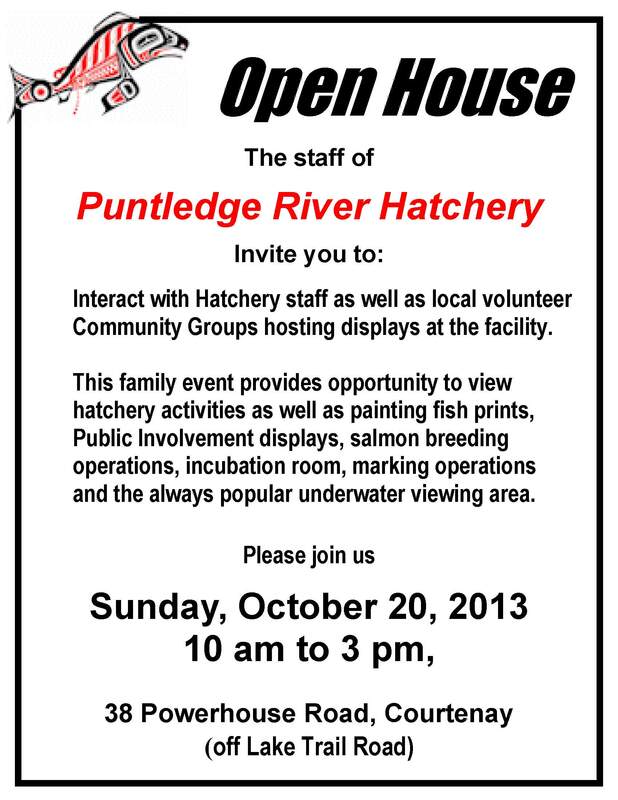 Interact with Hatchery staff as well as local volunteer Community Groups hosting displays at the facility. This family event provides opportunity to view hatchery activities as well as painting fish prints, Public Involvement displays, salmon breeding operations, incubation room, marking operations and the always popular underwater viewing area. The salmon have returned to the Tsolum River! This is the very best news I’ve heard and/or seen in a very long time. My heart soars. This is a celebration worth sharing. and, just so you know, the Tsolum is a no fishing river. It is now designated only for salmon spawning. After 50 years as an officially “dead” river, the Tsolum is alive again. The river died as a result of a speculative mining copper mining operation that lasted only 14 months, but left toxic levels of copper and arsenic draining into the river. After 25 years of effort of a small group of dedicated people who protected the river from loggers, cows, and who persistently sought a lasting solutions, a few years ago the tailings were finally capped in a manner that worked. A hatchery was established, and the river has slowly returned…the first year, 7 salmon were counted, the next 48, etc..until this year 35.000 were counted in one day. 55% pf those salmon are wild..not begun in the hatchery. Because of the salmon, bear, cougar, wolf, eagle, osprey, and many other wild animals are living and thriving in the area again. The forest will thrive as they leave carcasses in the woods that will feed the trees and plants. The pink’s carcasses in the river will supply the nutrients needed for coho to return, as their juveniles stay in the river for a year, and need the pink run to sustain themselves. Project Watershed would like to congratulate our friends and neighbours at the Tsolum River Restoration Society on achieving yet another amazing milestone in their ongoing efforts to keep our Valley beautiful, naturally. Shaw TV in their new go!Island section has produced a video to help spread the word about the new streamkeepers group Project Watershed is helping get off the ground. 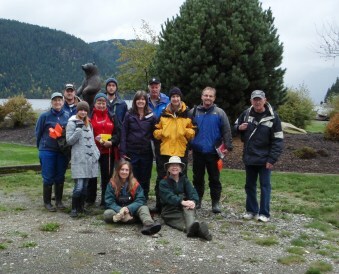 The new stramkeepers group would be for the Glen Uruquhart and Mallard Creeks. The video highlights the challenges the creeks face and the benefits a focused streamkeepers group could have. Do you like being outdoors? Looking for a way to make a change in your neighborhood? Want to meet other people who care about the environment? Glen Urquhart Creek and Mallard Creek are in need of volunteers to organise into a Streamkeepers group. These two creeks are located on the Estuary flats and run through East Courtenay and Area B in to the Dyke Slough (see map). The portion of Glen Urquhart on the flats is fish bearing as is the Mallard. Both have been affected by human settlement and require attention of a few caring volunteers. 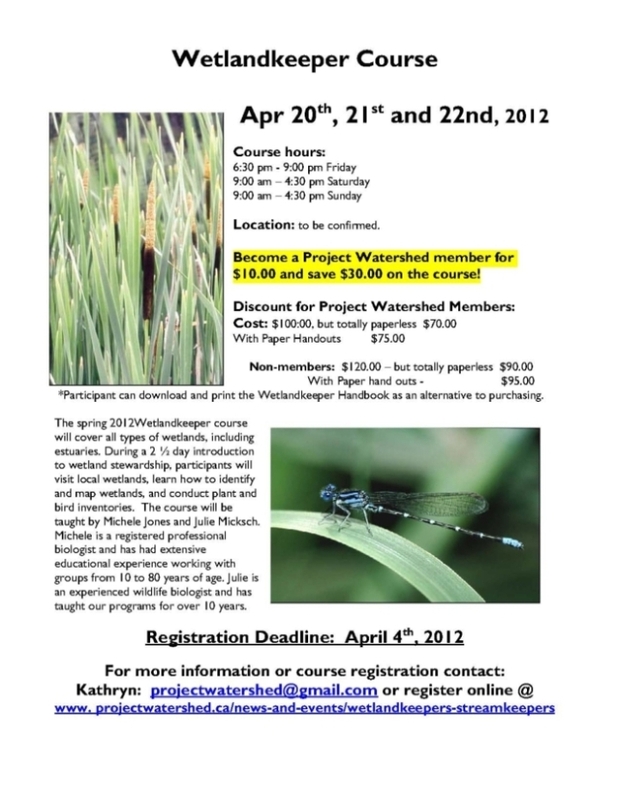 Project Watershed Society is offering mentoring to get you on your way. The Comox Valley is a network of streams and rivers. These waterways and their associated riparian areas move water, nutrients and sediment through the Valley, provide habitat for a vast number of species and make our Valley a scenic and lush place to live. Many of the major stream systems have a Streamkeeper group who help keep them healthy with tasks like invasive species removal, unplugging blockages, water quality testing, and fish habitat restoration. Some streamkeepers groups stay small and others become large organisations that embark on exciting projects and public education. Millard-Piercy Creek Streamkeepers (http://www.millardpiercy.org/) and Brooklyn Creek Watershed Society (http://brooklyncreek.ca/) are good examples of larger groups stewarding urban streams. 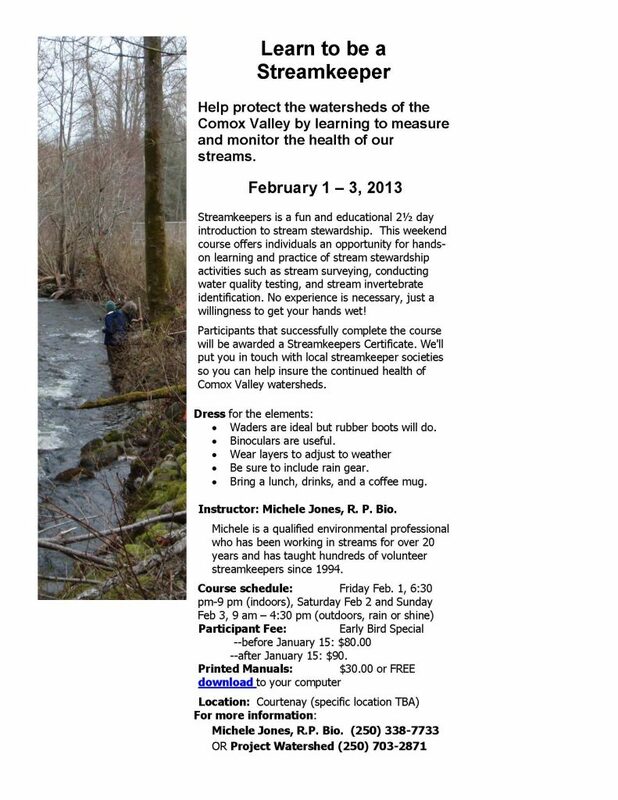 If you are interested in becoming part of a Streamkeepers group for the Glen Urquhart/Mallard Creeks or are interested in Streamkeeping in general contact Project Watershed cvpwbill@gmail.com. The Fish and Wildlife Compensation Program (FWCP) has announced funding towards one fish and one wildlife project within the Campbell River Watershed and funding towards four fish projects within the Puntledge River Watershed. Projects include a marmot recovery program and a program that studies coho smolt/fry migration in the upper watershed of the Puntledge River. FWCP funds are provided through BC Hydro and managed in a partnership with the Province of British Columbia and Fisheries and Oceans Canada to conserve and enhance fish, wildlife and their supporting habitats affected by the creation of BC Hydro owned and operated generation facilities in the Coastal, Columbia and Peace regions of British Columbia. FWCP has committed $71,390 to projects within the Campbell River Watershed and $292,531 for projects within the Puntledge River Watershed. All research and project work will take place in 2012/2013. “We are funding two important restoration projects that target the fish habitat on the Salmon River and the continued expansion of the marmot population,” says FWCP Coastal Board Chair, Brian Assu. Applications are reviewed annually in the Coastal region by both technical and board-level committees that include representation from all program partners, First Nations and the public. Projects are chosen based on technical merit, cost vs. benefit, level of partnership, linkages to watershed-specific priorities and overall benefit to the FWCP’s mandate and vision. The FWCP in the Coastal region has funded approximately $4.4 million in projects on the Campbell River System and $2.3 million in projects on the Puntledge River system since 1999. For more information and to find out how your project can apply for next year’s funding visit fwcp.ca. The Salmon River – Big Tree SideChannel Performance Improvements project ($4,840), led by the BC Conservation Foundation, will evaluate the Side channel that was constructed in 2008 and determine if there are any opportunities to improve fish access. In its sixth year, the Vancouver Island Marmot Buttle Lake Supplement Project ($66,550) will continue to expand the marmot population and support the Province of B.C. and its Vancouver Island Marmot Recovery Program. Continuing on the success of the past five years, the project will again release up to 30-40 marmots at approximately 6 sites in the vicinity of Buttle Lake to augment the current population. The Assessment of Homing Behaviour of Puntledge Summer Chinook Hatchery Returns project ($57,778) continues in its second year. The project will determine if Chinook that are imprinted in Comox Lake will have a higher return rate compared to adults that were reared at the Puntledge Hatchery with no imprinting. Now in the construction phase, the Puntledge River Hatchery Summer Chinook Rearing Consolidation project ($151,184) will install additional tanks to the chilled water acclimation system that will allow for summer Chinook to be held at the Hatchery. Chinook and coho smolt/fry will also be assessed for a third year ($78,620) as the project continues to analyze the migration of the fish in the upper watershed. And the fourth fish project ($4,950) will prepare a habitat improvement plan and budget for restoration of an area in the Courtenay River Estuary. Trials to see if controlling river flows could boost the summer Chinook salmon population in the Puntledge are about to start. B.C. Hydro, which can influence flows by adjusting the amount of water released from Comox Dam, will be working with the Department of Fisheries and Oceans and Project Watershed volunteers on the program. The focus of their attention is the fish diversion weir at the DFO’s Lower Puntledge River Hatchery, off Powerhouse Road in Courtenay. When the fish return to the river to spawn between May and August, the weir prevents many of them going further upstream – but when the water is flowing deep and fast, more of them are able to leap over the barrier. Being able to stop the fish at that point is what staff at the hatchery want, as they can then net and transfer them to tanks held at the ideal 15 degree temperature needed for summer Chinook to thrive until they are ready to spawn. That allows the maximum number of eggs to be gathered so the hatchery can bring on a new generation to be released back in the river to start the life cycle over again. Now a series of tests is to be undertaken to work out the impact of different river flows on the ability of returning salmon to leap over the weir. As the summer Chinook start to return, different pulses of water will be sent from the dam on different days during May and June to see how the fish behave. In summer, river flows are generally low enough to keep most fish downstream of the barrier, but in the early stages of the return they can be significantly higher. B.C. 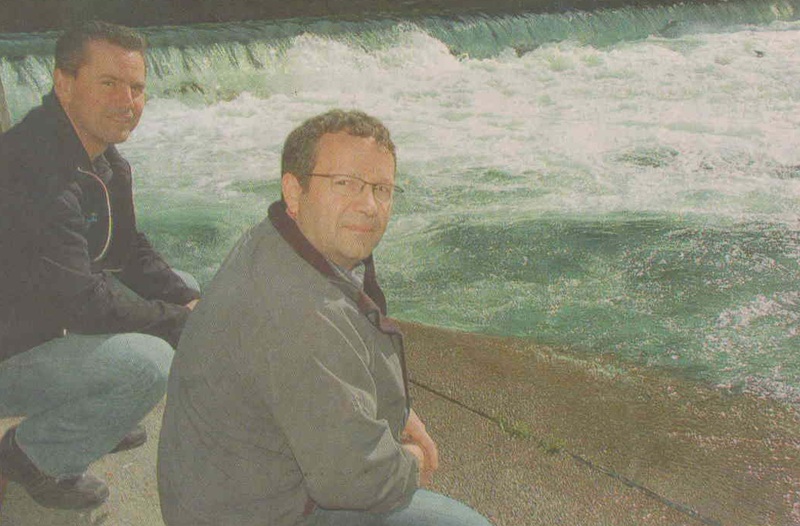 Hydro has wider responsibilities to ensure water levels upstream at Comox Dam are controlled, and sometimes needs to release extra water through the sluices. At other times, heavy rain or late snow melt, coupled with uncontrollable additional flows from the Browns River tributary, sends more water over the weir than DFO would like to see. But those acts of nature could, to some extent, be mitigated by B.C. Hydro if it knew what the ‘tipping point’ at the weir for fish really was. The power company might, for example, be able to hold back water at the dam for a while so as not to exacerbate short-term increased natural flows. So the trial now about to start will see the river being made to run at 60, 70 and then 80 cubic metres a second as fish approach the weir, to see what the tipping point really is. If, for instance, it were discovered that most fish can’t leap over the weir at 70 but can at 80, Hydro would have a much clearer idea of how its water releases might impact the hatchery. The tests will involve DFO staff in scuba gear observing the actions of returning fish in the river for set periods during pre-arranged pulses of water, while Project Watershed volunteers on dry land will count how many fish can jump over the barrier. The DFO’s watershed enhancement manager at the hatchery, Darcy Miller, said concerted efforts were being made to support the summer Chinook run, as the Puntledge was one of only two places on the Island where it still occurred. In the late 1980s and early 90s, barely 100 summer Chinook were returning to the river each year and it was dangerously close to the end. But various initiatives had seen the numbers rise to about 1,100 annually. The goal is to restore the run to between 2,500-3,500 a year, and every extra fish netted at the weir meant an extra 4,500 eggs could potentially be gathered to allow more fry to be raised and released later. In turn, that increased the chances of a bigger return of adult fish three or four years later. He noted the DFO had learned from recent studies that early migrating adult fish move through river systems better than later returns, resulting in a much higher rate of survival to spawn. So the enhancement strategy for the Puntledge run aimed to capture more adults from the earlier stages of the four-month run. The problem was the river naturally tended to flow faster and deeper at that time, so more fish could get over the weir. The trials should help them get a better handle on how that might be managed. For B.C. Hydro, Stephen Watson said the power company had several responsibilities as part of its duties to manage the Comox Lake dam and flows from it. While the bulk of the water was used for power generation, the lake and river were also the source of drinking water for much of the Comox Valley. In addition, there were recreational requirements, like providing fast flows on certain days for kayakers, as well as specific flows needed by DFO for fish management and migration. As a result of the trials to support the summer Chinook run, people going tubing might at times experience a rather fuller river than they expected for the time of year. But the trials themselves would not result in dangerous flows. Miller invited anyone interested in seeing the Puntledge Hatchery to drop by for free self-guided tours between 8 a.m. to 3: 30 p.m. seven days a week. He suggested the best times to see the most fish through the aquarium-style windows of the rearing ponds was in the spring and fall, but people could learn about the work of the hatchery from information boards around the site all through the spring, summer and fall. The Fish and Wildlife Compensation Program (FWCP) has announced $159,000 in funding towards fish and wildlife projects within the Puntledge River watershed. The FWCP funds projects to conserve and enhance fish, wildlife and their supporting habitats affected by BC Hydro owned and operated generation facilities in the Coastal, Columbia and Peace regions of British Columbia. “These are important restoration and research projects that target gravel placement for spawning salmon, fish passage on the Salmon River, riparian habitat in the estuary, and the marmot program,” says FWCP coastal board chair Brian Assu. “These diverse and important projects reinforce the continued positive partnerships between the FWCP, local First Nations and community groups.” The FWCP is delivered through a partnership between BC Hydro, the Province of B.C. and Fisheries and Oceans Canada. Three fish projects were granted funding and are all to be led by the Comox Valley Project Watershed Society (CVPWS). The Assessment of Homing Behaviour of Puntledge Summer Chinook Hatchery Returns ($33,500) will determine if chinook that are imprinted in Comox Lake will return compared to adults that were reared at the Puntledge Hatchery. This is the continuation of a SEED that was funded in 2010/11. Chinook and coho smolt/fry will be assessed for a second year ($100,000) as the CVPWS continues to analyze their migration in the upper watershed. A third fish project ($4,950) will prepare a habitat improvement plan and budget for restoration of an area of Simms Millennium Park Pond. Wildlife funding went to the McPhee Meadows Land Acquisition project ($20,000) which will complete a management plan for the newly acquired McPhee Meadows land that is located near the Puntledge Generating Station. Projects are chosen based on technical merit, cost vs. benefit, level of partnership, linkages to watershed-specific priorities and overall benefit to the FWCP’s mandate and vision. The FWCP in the Coastal region, formerly known as the BC Hydro Bridge Coastal Fish and Wildlife Restoration Program, has funded approximately $2 million in projects on the Puntledge River System. For 2011, the FWCP’s total funding for the 15 hydroelectric systems within the Coastal region will be $1.64 million. All research and project work will take place in 2011/2012. For more information and to find out how your project can apply for next year’s funding, visit fwcp.ca.